Fishtail wedding dress with sleeves looks truly luxurious. Moreover, the bride in it is amazingly beautiful. This dress style is also called mermaid dress. That is because it resembles the body of the lovely Mermaid. Actually, who does not know the incredibly touching and tragic love story of this fairy tale character? So this makes a mermaid wedding dress, especially symbolic gown. The distinctive feature of this gorgeous bridal attire is its narrowness. That is, a dress clings to the figure from the top to the knees very tightly. Then it is flaring from the knees to the floor. The dress may also have a train. Indeed, such a dress is a great choice for a sensual bride. Undoubtedly, every woman in such a dress will feel very special. However, note that the fishtail bridal gown requires a solemn wedding ceremony and impeccable taste in the choice of the celebration scenario. If you prefer a fishtail wedding dress with sleeves, you should know which fashion trends to follow, choosing such a dress. Ruffles. Ruffles give the bride a certain coquettishness and naughtiness. Vertical tiered ruffles look especially original. It is possible to decorate the ruffles with lace. Besides, the ruffles can be emphasised with a bright and quite wide piping. Neckline. The sweetheart neckline fishtail bridal outfit will perfectly suit the bride with large breasts. The V-neck mermaid dress is a good option for the girls with wide hips. But generally, all neckline types are magnificent for this dress type. Open back. Backless lace mermaid wedding dress is an extremely seductive design. The bride who aspires to wear such a dress should strictly evaluate her back skin and her bearing before making a choice. Simplicity. Choosing the fishtail dress, it is better to avoid intricate decorative elements, ornaments, and excessive bridal accessories. But this does not make the dress looking poor or not exquisite. By the way, even one accent, such as an elegant ribbon, combination of different fabrics or a neckline of unusual shape can give a zest to the fishtail bridal outfit. Definitely, in the fishtail wedding dress with sleeves, sleeves are the real highlight of the bridal attire. The sleeves make the bridal look a little bit mysterious and modest. Although they do not interfere with other open elements, for example, the open back. By the way, the backless sleeved fishtail wedding dress looks really breathtaking. Also, long sleeves also have functional value. Thus, they cover tattoos, scars, and other skin blemishes. However, here it is important to find the right balance by deciding which parts of your body you want to hide and which to open. Anyway, your bridal attire with sleeves will certainly be sophisticated and intriguing. We know how the wedding day and the choice of the bridal gown are significant for you. 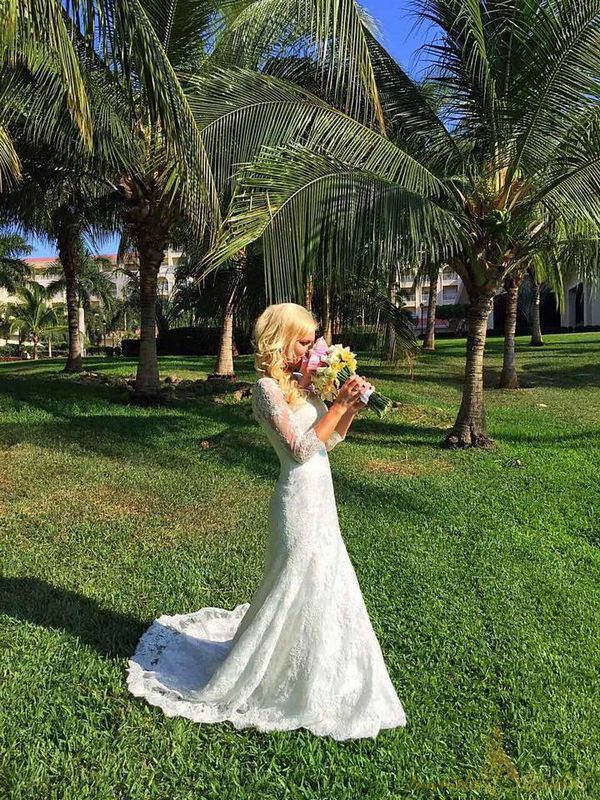 That is why among the variety of bridal outfits which we represent at the Ingrida Bridal Salon you are sure to find your ideal fishtail wedding dress with sleeves. Moreover, you can order a custom made wedding dress which we will tailor for you according to your individual measurements. So the result will be exactly as you expect it to be! In this case, you will get a real masterpiece for a very reasonable price. Our team will gladly help you realise your most cherished wedding dream and make your bridal outfit truly fabulous and unforgettable. Our doors are always open for you!